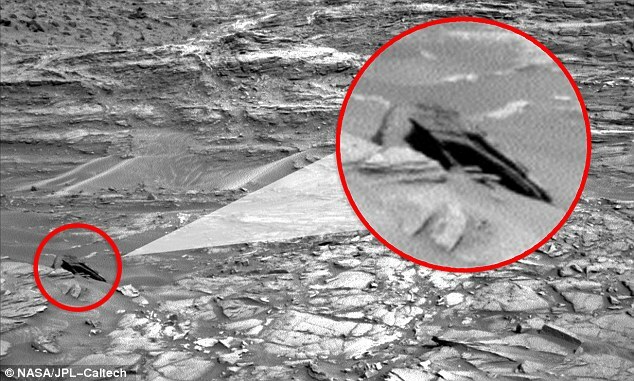 Conspiracy theorists can't seem to get enough of the mysterious images taken by NASA’s Mars Curiosity Rover. In their newest 'discovery', they claim to have found the Star Destroyer from Star Wars on Mars. UFO Sightings supporter Scott Waring wrote “I found this anomaly in the latest Curiosity Rover photo. The black object looks like a crashed UFO,” According to him the 'craft' is merely about 2.5 to 3 metres across, 'so it possibly only held a few travelers.' The imaginary Star Destroyers were the warships used mostly by the Empire in Star Wars, and were many times bigger than the 'craft' Waring found on Mars. Waring also wrote 'There is only one photo of the ship. The rover usually takes many of each area, but not this one. Perhaps tomorrow it will take more,' This isn't the first time Hollywood hits have favored alien hunters. Just a few weeks ago, a group of Conspiracy theorists said they had found a mysterious 'facehugger crab' on the red planet. Again scientists have called this a case of pareidolia. Seth Shostak, director of the Centre for SETI Research said this is the psychological reaction to seeing faces and other important and everyday stuffs in unplanned stimulus. It is a type of apophenia, which is when people see shapes or connections in random, unrelated data.